» New L.A. Sign Ordinance: More Signs? More Blight? New L.A. Sign Ordinance: More Signs? More Blight? After a long slumber, a new city sign ordinance is finally heading for the L.A. City Council, albeit in a form that could enable a net increase of hundreds of thousands of square feet of off-site advertising on digital displays and other sign types in a wide area of the city. The ordinance was approved more than two years ago by the City Planning Commission (CPC) after multiple meetings and hours of public hearings. 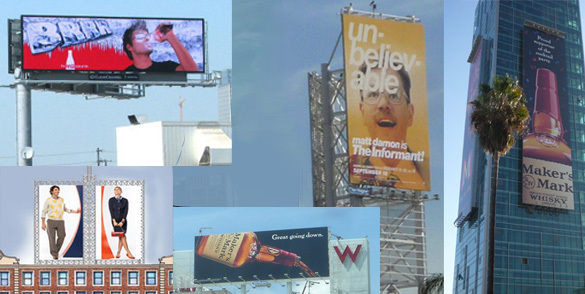 One of the most contentious issues in those hearings was the provision allowing generally prohibited sign types within sign districts, which were widely seen as having led to a big proliferation of outdoor advertising without any significant community benefit, such as a reduction in visual blight through the removal of conventional billboards. The CPC-approved ordinance retained the provision for establishing sign districts, but instead of allowing them in any commercial zone, as previously, it restricted them to 20 high-intensity commercial areas. Even more significantly, the ordinance required the removal of billboards in the surrounding community at a square footage ratio of more than one to one in exchange for permission to put up a new off-site or other prohibited sign type in the district. At that time, two sign districts had been established, but at least a dozen others had been proposed in some form since the city council adopted an off-site sign ban in 2002. Two–in Hollywood and downtown–had been approved by the CPC but not yet been voted on by the City Council, and commissioners decided that only those two should be “grandfathered.” The others would have to proceed under the new, much more restrictive rules. Cries of unfairness arose from lobbyists for business and development interests, and those cries were obviously heard, because the revised ordinance now scheduled to be heard Aug. 9 by the council’s Planning and Land Use Management (PLUM) committee allows any sign district “initiated or applied for” by that upcoming meeting date to be processed under the old ordinance that allows sign districts in all commercial areas and doesn’t mandate any billboard reduction in return for the lucrative entitlement of new advertising signs. To give an example, the developer of the Midtown Crossing shopping center now under construction on Pico Blvd. east of LaBrea Ave. applied for a sign district to allow more than 15,000 sq. ft. of supergraphic signs facing motorists on the surrounding streets. That proposal never got as far as a CPC hearing, so under the CPC-approved ordinance it wouldn’t be grandfathered and would have to meet the stricter standards of that new ordinance. Moreover, because the project isn’t in one of those 21 designated areas, it wouldn’t be eligible for a sign district and there wouldn’t be any way the signs could go up. If the PLUM committee approves the ordinance as revised, however, the project that has received millions in loans from the city could proceed with seeking entitlements for the signs, estimated to be worth upwards of $100,000 in monthly revenue. Other sign districts, such as one covering a wide swath of Koreatown and another proposed for several square blocks just north of the 110 freeway downtown, exist only as motions by city councilmembers and haven’t undergone any processing. Others, like the three districts proposed for the Universal Evolution project that would enable big new digital billboards in the Cahuenga pass area, are part of draft environmental impact reports but haven’t gotten to any public hearings. At least one proposed sign district, for the Figueroa Corridor downtown, was put forward in a motion by Councilwoman Jan Perry just this year, or two years after the CPC approved the new sign ordinance. It would presumably be processed under the older, more liberal rules, as would any sign district proposed between now and Aug. 9. Is the sign district “grandfathering” the only significant change in the CPC-approved sign ordinance? Hardly. We’ll take up other changes that may not be as far-reaching, but are nevertheless troubling, in the next post.